laboratory procedures. 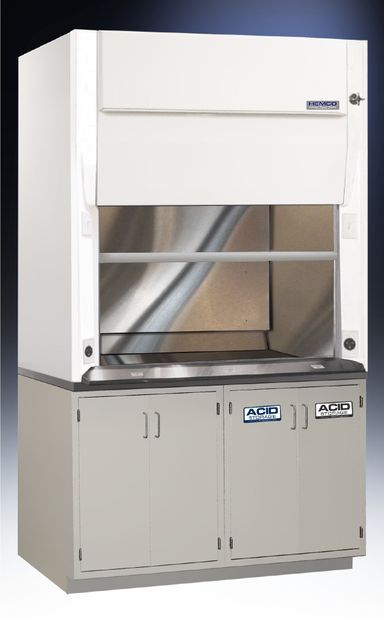 Perchloric Acid Hoods are offered in sizes 48”, 60”, & 72” widths and include a dedicated wash down and exhaust system. 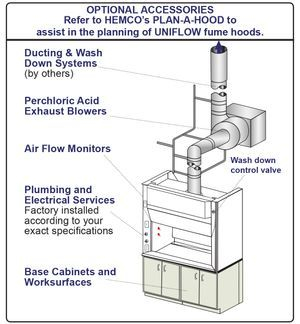 It is recommended to thoroughly wash down fume chamber and exhaust system after each use. 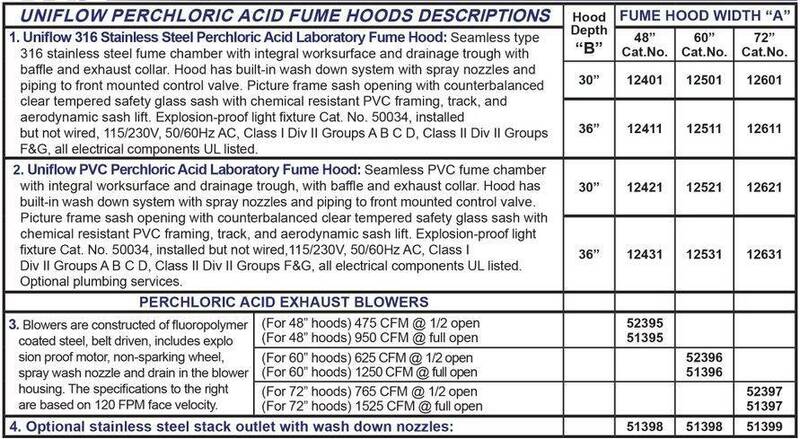 Note: Perchloric Acid Hoods are for perchloric acid use only. UniFlow Superstructure constructed of either PVC or 316 stainless steel features exclusive unitized dual wall construction for superior chemical resistance (NO RUST), strength, and durability. Rear drain trough is integral to superstructure. Dedicated wash down with integral piping spray nozzles & remote control on right column. One-piece interior fume chamber type 316 stainless steel fume or PVC fume chamber and baffle. Meets NFPA-45 classification with flame spread of less than 25 per ASTM E-84. 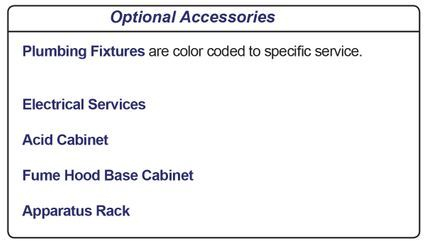 PVC or Stainless Steel Worksurfaces integral PVC or 316 stainless steel worksurface. 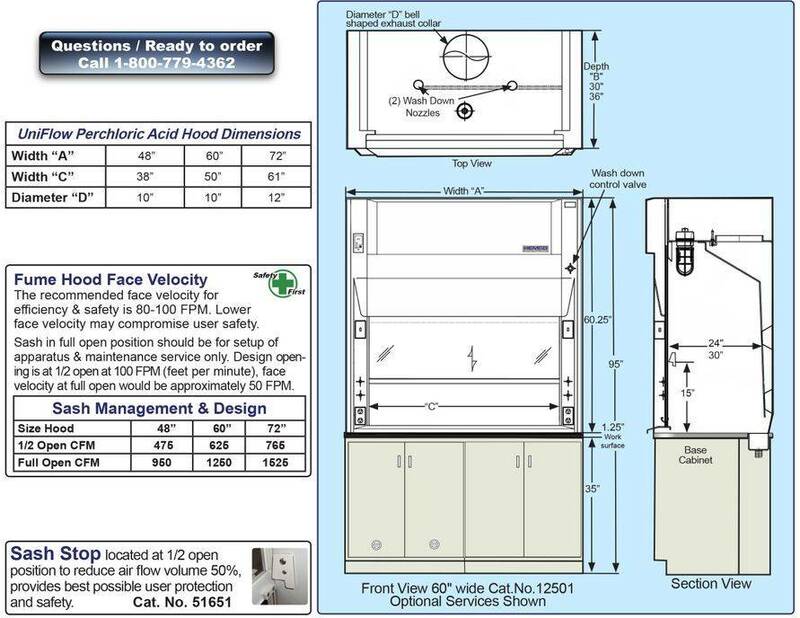 Access Panel removable to access ducting connections, plumbing & electrical services from a single point electrical box, 115/230V, 50/60Hz AC operation. Energy efficient explosion proof light fixture with light switch on left column, all factory installed. 28” Vertical Sash Height provides ease of access for apparatus set-up in fume chamber. 24" or 30" interior reach in depth, and 44" interior working height. Sash is perfectly counter balanced, 3/16 tempered safety glass, coated stainless steel cable with stainless steel pulley assembly. Framed in nonmetallic PVC framing, track, and aerodynamic sash lift for ease of movement and air flow efficiency.